Here at our childcare, we ensure that our child(ren) get the best possible meals everyday. 90% of all meals are home made using no artificial sugars or salt. These meals are approved by the state, and under state inspection. We ensure that each food is appropriate for that child's age group. In addition, we do not serve fried foods or juice. All foods are either broiled, steamed, or baked. Because we are state food certified, we cannot allow parents to bring food for their child since their food might not comply with state standards. To further insure that our children get a balanced meal, dinner menus are always serviced at lunch time. These menus always consist of a variety of meats, salads, vegetables, and sugar-free desserts. You can rest assure children will not go hungry here. For children 11 months and under, breast milk or formula must be provided. 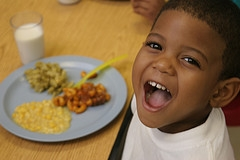 Since we are under a state food program, please do not bring unauthorized food or snacks to the childcare. It is our policy not to accept individual food or snack portions for any child.